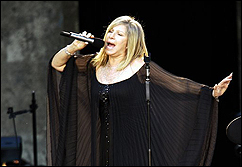 DUBLIN, Ireland (CelebrityAccess MediaWire) — Concertgoers were left frustrated with a Barbra Streisand concert in Dublin, Ireland this week, after being forced to pay exhorbitant ticket prices, deal with bad weather and three-hour traffic delays, and some even found that there were no seats available once they finally made it to the concert. Organizers MCD and Concert Promoters International apologized to fans in a joint statement, saying that Streisand delayed her start by 45 minutes to accommodate the late arrivals. They added, “Some fans who arrived late encountered problems with their seating.